Discussion in 'Auto News' started by GTPNewsWire, Sep 8, 2018. This article was published by Joe Donaldson (@Joey D) on September 8th, 2018 in the Automotive News category. JvM and IngRobNy like this. Is it too soon to ask if this is coming to GT Sport? GranTurismo guy, TypeOne, GregOr1971 and 17 others like this. Is it too soon to ask about GT7?... and it's yachts, planes, motorbikes and autos? Or have yall yet to reconize sport as an abreviation of what Gran Turismo has been prior to pay to play PS4? Nice boat! There needs to be a GT Ocean. And it needs stuff like this. Not that surprised now tbh. It looks cool. When is that Bugatti yacht coming out? I think itsc got a furnace. GregOr1971 and SCPH1000 like this. Wheres the largely obnoxious grille that Lexus' have these days? IngRobNy and Auditore like this. I don't see much design correlation to their cars. Kinda makes me wonder what's the point. They made a car that looks like a yacht, and now they're making a yacht that looks like a car. What the ****? breyzipp and kolio like this. 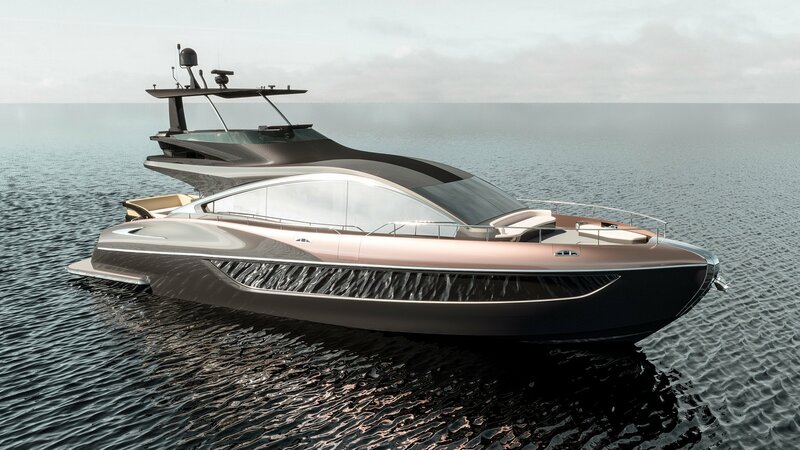 To do what Porsche Design Studios is doing, who are also building yachts. Apparently, both this & the Sport Yacht concept were designed by Toyota's Marine Department & are being manufactured by Carver Yachts. The Sport Yacht used twin RCF V8s, but I have no idea what they'd need to power this. It's a choice of either a 900 hp Volvo diesel or a 1,000 hp Volvo diesel, depending on how much you want to spend. It's not even a hybrid. We need Wet Nellie first. I have a weak spot for yachts. If I had the money, I'd have one. Just incase anyone is interested/wondering. It will for sure have two of the engines always. Whichever option you choose. So overall 1800 or 2000hp. 20832 and infamousphil like this. I really struggle to understand the point of boats like this... It will cost at least $3M (inc. taxes) with the right options.... and at least another 10% of that a year in running costs... could be as much as 20-25% if you use it regularly. All for something only capable of inshore cruising in good weather/flat seas. Most of the decent sized motor yachts in the marina our boat is moored at never move. The owners seem to use them as a sort of fixed caravan they come down to on a weekend and just sit on the boat. $3M would buy a very nice 80ft Swan or Wally sailing yacht, that would easily be capable of taking you round the world, with running costs in the 5% range. Why do all Lexus have to be so ugly?